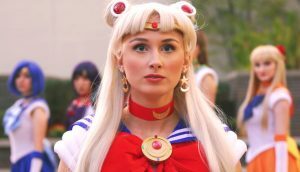 Sailor Moon is no stranger to the world of live-action, from 2003’s Pretty Guardian Sailor Moon tokusatsu show to an abundance of fan films that have been shared over the years. We’ve covered previous efforts in the past, and those hungry for more will want to check out the latest from director Fred Grant. Written by Greg Garrison, the Sailor Moon Fan Film project was executive produced by Cosplay Against Bullying and features Tori Durin Purcell as Sailor Moon, Katie George as Sailor Jupiter, Anna Faith as Sailor Venus, Riki LeCotey as Sailor Mercury, Jane Sin Zabate as Sailor Mars, Sam Schneider as Nephrite, Melting Mirror as Queen Beryl, and Michael Bow as Tuxedo Mask.